A small group of classic works written at the beginning of the 20th century had a huge influence on riding as we see it today. Certainly the Cavalry School’s 3 volume “Horsemanship and Horsemastership”, the works of Harry Chamberlin, and those of Piero Santini belong in this small group. “The Manual of Equitation of the French Army for 1912” should be included in this group. It was published by the U.S War Department for use in the Mounted Service School. This French Cavalry Manual laid the foundation for the system we use today. Although you’ll not find the forward seat in the Manual of Equitation of the French Army for 1912, neither will you find extreme collection and carriage or the teaching of “high school” riding. Instead you’ll find guidance for instructors, instruction on co-ordination of the aids, gymnastics and position of the rider, and a system for breaking and training horses. An original copy of The Manual of Equitation of the French Army for 1912 is a rare find. In fact my old and brittle copy is stamped with the U.S. Military History Institute and has penciled on the inside “Keep all copies – scarce”. Fortunately for us, someone didn’t heed those words and now I’m able to offer this down loadable version to you. Unlike many updated versions of old works, I’ve not changed any of the information in this manual. I’ve not changed sentence structure or order of information, nor have I added any information of my own, except for a modern forward. I’ve reformatted it, given it a little color, a new typeface and done my best to re-number the table of contents. 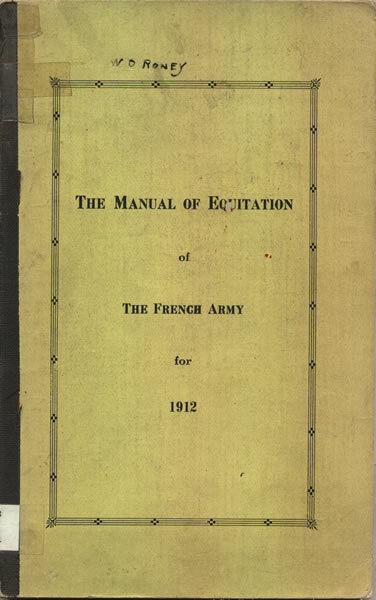 I hope this will make the Manual of Equitation of the French Army for 1912 an easier read and a convenient download. My goal in reproducing The Manual of Equitation of the French Army for 1912 is to make it easily available to students of horsemanship. I hope that as you study it, you’ll gain a deeper understanding of the military seat and tradition that was passed to us through the U.S. Cavalry at Fort Riley. If you would like to have a copy of the pdf file for The 1912 French Cavalry Manual, just sign up for the U.S. Horsemanship newsletter using the convenient form at the top right on this blog. You will receive a link so that you can down load your pdf of the French Cavalry Manual. You’ll also receive the updates to ushorsemansip.com when they are posted. I’m a member of the Society of Military Horse and would like to have the free download. Thank you very much in advance. i would like to have the free download. Thank you very much in advance. i CANT `T FIND A SUBSCRIBE FORM ? I know that different servers and computers show us different things….. Do you see a black box (rectangle) in the center column of the blog page? It should be right next to the post. Just put your name (first only is OK) and email address in the marked spots. You should receive the French Cavalry Manual first and then the foxhunting articles the next day. As I recall sometimes the center column (There are 3 columns) sometimes loads slowly. If you don’t see 3 or if you still don’t see the form please let me know right away and I’ll work on a solution. I would like to get a copy of the French Cavalry Manual but I can’t find the download button. I changed my newsletter delivery service recently and am sending the French Cavalry Manual by request. I’ve sent yours and hope you have it by now. Let me know if you have difficulty receiving it. Thank you for visiting U.S. Horsemanship! I would like a free download of The 1912 French Cavalry Manual. Would love to get a copy of the Military Horse 1912. There is a form on the main page of US Horsemanship to sign up for the newsletter. The download is a gift for signing up. I’d love to have you! I would love a copy! Can you send it to me?